PHNOM PENH, Jan. 30 (Xinhua) -- Chinese and Cambodian artists jointly performed here on Wednesday to celebrate the launch of the China-Cambodia culture and tourism year 2019. Cambodian Deputy Prime Minister Hor Namhong, Chinese Minister of Culture and Tourism Luo Shugang as well as Chinese Ambassador to Cambodia Wang Wentian were among some 800 spectators at the event held at the iconic Chaktomuk Theater. 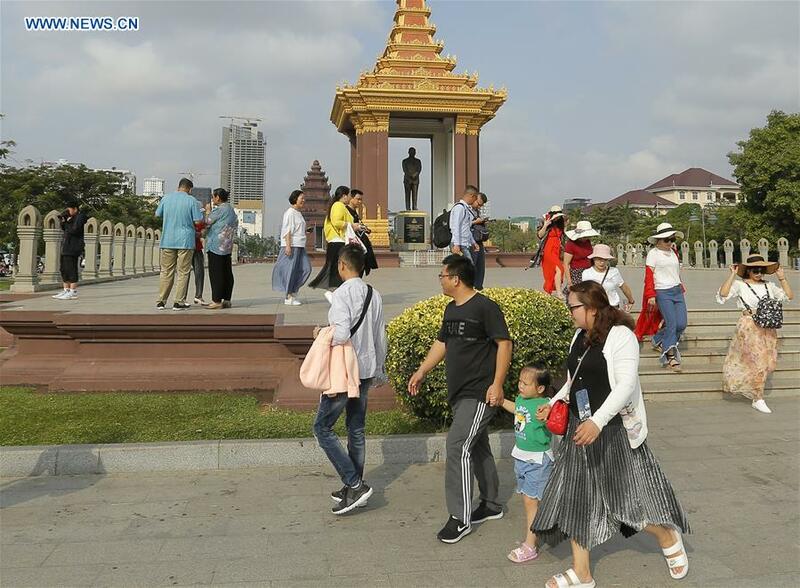 The two countries set 2019 as the China-Cambodia culture and tourism year during Cambodian Prime Minister Samdech Techo Hun Sen's visit to Beijing earlier this month. Cambodian Tourism Minister Thong Khon said the country received 1.9 million Chinese tourists last year, up from 1.2 million a year earlier, making China the largest source of foreign tourists to the kingdom. He said the Southeast Asian nation is expected to attract 3 million Chinese tourists in 2020, 5 million in 2025 and up to 8 million in 2030. "The huge influx of Chinese tourists to Cambodia has importantly contributed to boosting Cambodia's economic growth, creating jobs and generating an income source for Cambodian tourism operators," he said. During the two-hour event, dozens of artists from the two countries jointly performed a variety of traditional dances and sang songs together. Each of the performances drew hearty rounds of applause from the audience. "Personally, I like all of the performances, especially I admire a troupe of Chinse deaf and dumb artists for perfectly performing the Thousand-Hand Bodhisattva dance," Penh Yom, a professor of traditional dance at the Secondary School of Fine Arts in Phnom Penh, told Xinhua. "They followed the pulse of music well and showed their dance styles tidily as if they were not disabled persons," she said. "If it was not announced that they were disabled persons, we supposed they are normal persons." Another viewer Chhoeun Rin, a Grade-9 student at the Duan Hua Chinese School, said the performance was amazing, as all artists are very talented, and he hoped to see such a wonderful performance every year.